Creation Process Do you Remember? TicketsauditionNews About Company Our Vision The Team Contact Dance Program Training Curriculum Mentors Success Stories Guests Scholarships Repertoire IELE - New show 2019 VIVA - New Show 2019 Marbled WE Spark Rooted 5inco Human Here and After What We Leave Behind You me and them Impact 2017/2018 Annual Report 2016/2017 Annual Report Success Stories Sharing experiences Community LMD & Friends Dance Gala Workshop Open Rehearsal Drop-In Classes Volunteer Media Creation Process Do you Remember? 💫 We are still feeling the magic from yesterday's show. It's important to show that the art of dance is a powerful way to let our voices to be heard and you all were there to collaborate, appreciate and share your voices with open arms. 🤝Thank you to each Dance Company and school that took part in the show; your contribution to our dance community is appreciated to the max. 💚And to our most valuable Audience, thank you for taking the time to enjoy the LMDF vol.7 show we hope to see you all next season. Offer valid today through Sunday, February 17th, 2019. Shop Early - Ordering just takes a few minutes!! Invite your family and friends to join in! 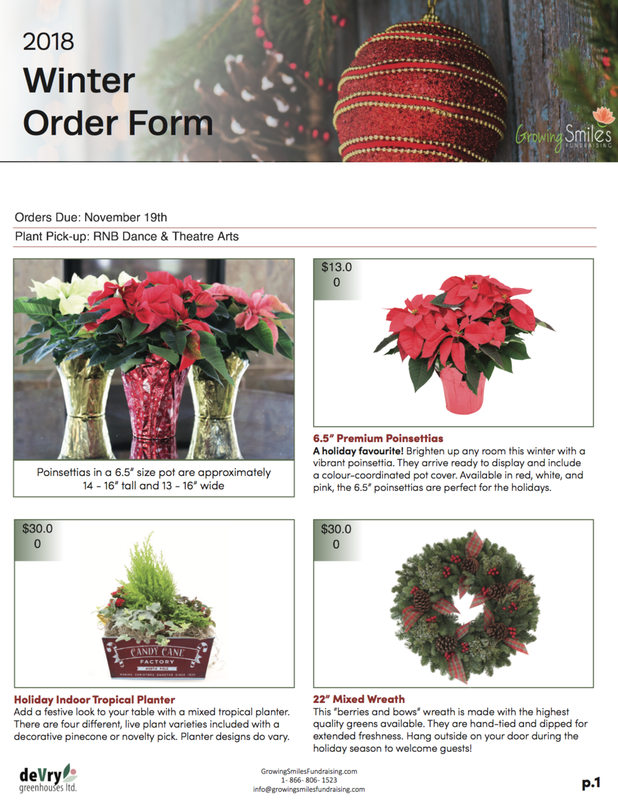 This winter we are selling beautiful, locally grown 6.5” Premium Poinsettias, Mixed Wreaths and Holiday Tropical Planters to help raise money for our programs. When purchasing any one of these items, not only will you be spreading holiday cheer, you will also be supporting an amazing cause. We could not do this without you! We would like to ask you all for your support to help RNB Dance and Theatre. This year RNB will continue to do our annual Purdys Chocolatier Fundraiser. THANK YOU VERY MUCH FOR PARTICIPATING IN THIS FUNDRAISER & we hope you have a wonderful holiday season! We would like to welcome our LMD Season 10 Dancers! These dancers will spend countless hours working hard to perfect their craft in the studio training, rehearsing, creating and around the community at workshops and other events. Get to know more about them. We just started our season, and we would love to invite you all to celebrate our 10th Anniversary. A milestone of dance, development, research, education, creation, transitions, community engagement, training, collaboration, and many more accomplishments achieved here in Vancouver and around the globe. As we mark a decade of writing beautiful stories and marking our artistic identity join us in celebrating ten years of success with three distinct shows and other events. Remember how amazing your Lamondance experience was the first time around? We are excited to launch our new series "Do you remember?”. This will be a series of videos that will take us on a journey back, remembering our creative process, choreographers and all of the shows in the ten years of WOW! With celebrations we bring new beginnings, we are excited to announce the start of our Apprentice Company, a pilot project that will prepare Lamondance for the launch of its Professional Company. We cannot wait to share more information with you! Because we genuinely think that sharing is a valuable thing we would like to share all the show reviews with you. From all of us at Lamondance, we'd like to thank you for watching our show. It was an honour to perform for you. Lamondance season 9 was a memorable season. “A show that will Evoke all the senses taking the audience on an unforgettable journey.” This company has a promising future ahead." "Such a beautiful range of styles and musical scores, with powerful and magnificently crafted choreography, exquisite stage lighting, and incredible dancers! Their pure talent, power and level of professionalism was en par with any major dance production I’ve seen." Passionate. Strong. Joyful. Well trained dancers. Wonderful choreography. Varied program. Thank you all. Lamondance Show "MARBLED" - Life has been thrown into motion, and there’s no stopping it. Begins June 1st and 2nd, 2018 | BlueShore Financial Centre for the Performing Arts at Capilano University. Lamondance presents new contemporary dance works another razzle-dazzle dance show that will conclude season 9. MARBLED is about transformation. The show unveils concepts as such as memories, liberation, energy, empowerment, relationship, and life change. It celebrates freedom as a movement form. Marbled presents cutting-edge choreography from Lara Barclay, Heather Dotto, Heather Laura Gray and Artistic Director Davi Rodrigues; The show also brings an exciting collaboration in between Lamondance and the Emmy-nominated composer and conductor Hal Beckett. 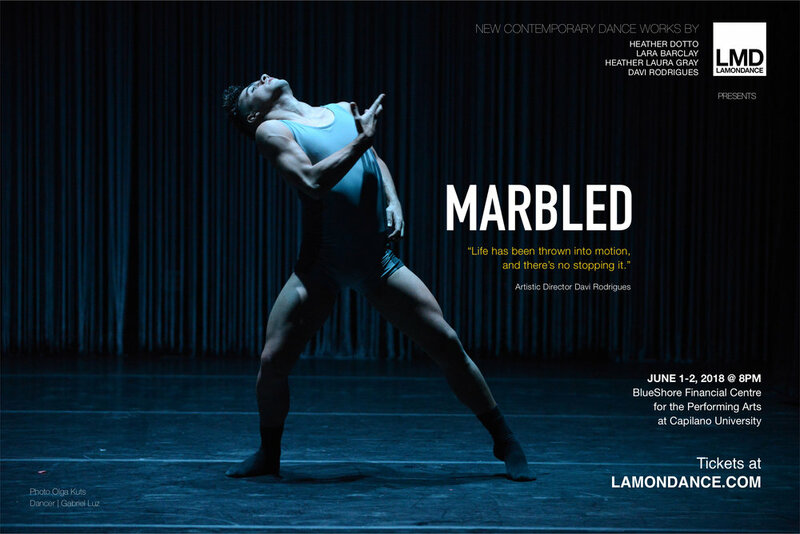 With an eye-catching-signature and being committed to creating high-quality shows, Lamondance launches "Marbled" following the company's vision to find new ways to create a show that can resonate with the audience; Shows that will Evoque all the senses taking the audiences on an unforgettable Journey. For those who are graduating from school and looking for post-secondary options, Lamondance offers a two-year contemporary based training program, perfect for anyone interested in refining their skills and developing the knowledge for a successful career in the dance industry. An excellent opportunity to immerse themselves in original choreography and to experience the concept of working with a professional dance company. The artistic director, instructors, and choreographers will bring their unique international experience and passion together to guide students towards a career in dance; As well as nurturing young Canadian talent, Lamondance also invites select Brazilian Dance students to join the program to share their experience and knowledge in dance; This allows for a beautiful cultural exchange between Canadian and Brazilian dancers. Former dancers have gone on to work with international companies such as “São Paulo CIA de dança” (Brazil), “Divinadança” (Brazil), “Nordhausen ballet” (Germany), “Theater Osnabrück” (Germany), “Halle Opera House” (Germany), “Grazer Oper” (Austria), “Tanzkompanie Der Oper Graz” (Germany), Dresden Frankfurt Dance company, “Wen Wei Dance” (Canada) and Gainesville Ballet (USA), "Batsheva Dance Company" (Tel Aviv, Israel) ‎among others. Don’t miss this great opportunity to be part of Lamondance Season 10. Space is limited for the 2018/2019 Season 10! Last Saturday (April 14th, 2018) we celebrated the arrival of the spring at the Spring Lights, a local celebration in Vancouver, presented by the Vancouver Cherry Blossom Festival. We were delighted to be invited by choreographer Heather Laura Gray to participate in the event created by Hfour which did a fantastic work illuminating Queen Elizabeth Park with vibrant projections and a new walkthrough experience. As in previous years, the illumination was set up for unobstructed views ideal for photography! It’s the first event of it’s kind in the world. With the design of the lights + Heather's choreography, our lamondancers enchanted the audience creating a unique and unforgettable experience welcoming the spring. To make the celebration even more special, we had the mother nature sending us drops of rain to make the magic complete all under a canopy of cherry blossoms. It was a night to appreciate the ephemerality and beauty of nature. Sincere thanks to the Vancouver Cherry Blossom Festival, Vancouver Board of Parks and Recreation and our guest choreographer Heather Laura Gray for inviting us to participate and share dance in this celebration of Nature. Are you a serious and committed Dancer that wants to be part of an authentic, challenging and unique dance program? 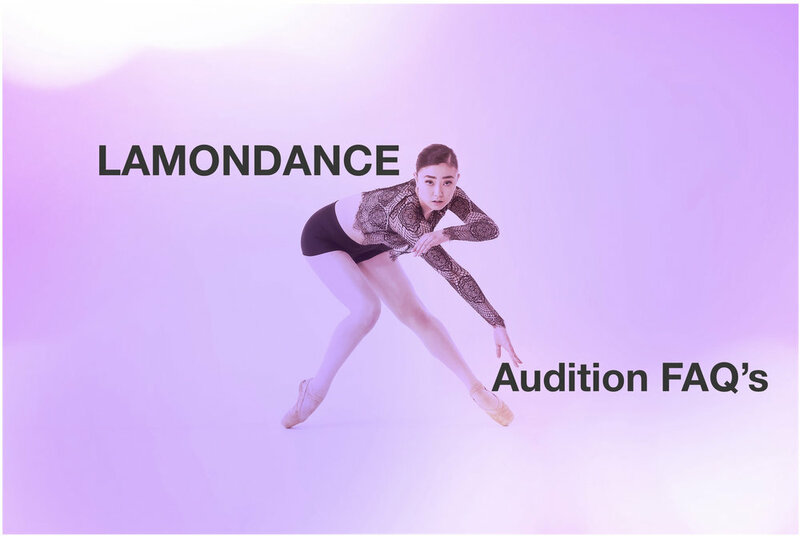 Lamondance Program is a demanding two-year contemporary based training program that will provide you with a high-quality training, performance skills and an unforgettable experience necessary to work in a professional dance company. Check out our FAQ's about our audition process. We are delighted to share that Lamondancers will be dancing at the Spring Lights Celebration of the arrival of the spring in Vancouver. Our guest choreographer for the show "Marbled" Heather Laura Gray, invited the company to take part in the celebration. Our dancers are thrilled with the opportunity to once again, be working with such inspiring choreographer. We would like to invite you all to celebrate with us the arrival of the spring, here in Vancouver. Parking is limited, please TravelSmart! Spring Lights is a local celebration of the arrival of spring in Vancouver, created by Hfour and presented by the Vancouver Cherry Blossom Festival. After a long winter, we invite you to experience illuminations, performance, and community; all under a canopy of cherry blossoms. This is a time to appreciate the ephemerality and beauty of nature. Hfour has been projecting on cherry blossoms in Vancouver for five years. It’s the first event of it’s kind in the world. This year, we will be illuminating a city park in Vancouver with vibrant projections, lighting, and light sculptures. 2018 will feature light art installations by Hfour, Ari Laser, Tim Rolls, Leó Stefánsson, and Samm Z Cooper, dance performances choreographed by Heather Laura Gray, with the participation of our dancers from Lamondance Season 9 and a musical soundscape by Adham Shaikh, the Tacofino food truck, and more! Best of all: it’s free to attend! Event date and venue subject to change, pending on peak bloom and weather. Check out springlights.ca for more info! DanceHouse, in partnership with Lamondance Training and Performing Company is happy to offer a unique Masterclass opportunity with Dorrance Dance (USA). The class will cover some of the fundamentals of house, including aspects of footwork, floorwork and the importance of a freestyle approach to the form. The cultural context in which this dance was created and where it continues to thrive will be discussed and underscored in the movement. Teachers: Ephrat Asherie and Matthew West. On this beautiful day where we celebrate International Women's day - We share this beautiful photo of "Get it out." In the photo, our female dancers take over the stage performing a creation from our guest choreographer Heather Laura Gray, one of the female choreographic voices composing our show "MARBLED." To all the women around the globe, you make our world a better place. May we celebrate it every day. Happy International women's day. We are delighted to announce that Lamondance will be performing excerpts of our newest show "MARBLED"
in a show presented by Deas Island Dance. The proceeds to benefit the Genesis Theatre. The show represents the soal of what a healthy community is on developing a sense of support and give back. Lamondance believes in giving back and helping out in the community and the world. Opportunities like that presented by Deas Island Dance should happen more often, it creates opportunities, refreshes the environment and allows the art of dance to reach all places in BC. The practice of giving back creates a virtuous cycle that makes everyone more successful. Thank you Deas Island for creating opportunities like that and engaging the community. We can't wait to share the stage with you. Check out a sneak peek of "MARBLED" a new creation by our Artistic Director Davi Rodrigues for our new production that will take place at the BlueShore Financial Centre for the Performing Arts at Capilano University, from June 1st - 2nd, 2018. An excerpt of "Marbled" will also be presented at our LMDF Dance Gala on February 24, 2018, at the BlueShore Financial Centre for the Performing Arts at Capilano University. 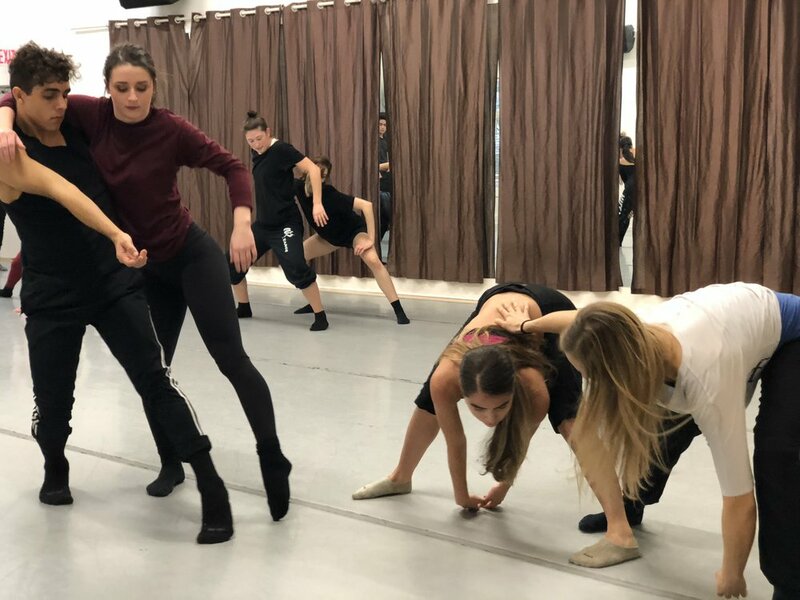 "Mapping memory" is the newest Lamondance creation by our resident choreographer Lara Barclay for the show "MARBLED" that will take place at the BlueShore Financial Centre for the Performing Arts at Capilano University, from June 1st - 2nd, 2018. "Get it out" is the newest Lamondance creation by our guest choreographer Heather Laura Gray for the show "MARBLED" that will take place at the BlueShore Financial Centre for the Performing Arts at Capilano University, from June 1st - 2nd, 2018. We are happy to announce the name of our 2017/2018 new production that will take place at the BlueShore Financial Centre for the Performing Arts at Capilano University - North Vancouver on June 1st and 2nd, 2018. At Lamondance we are always looking for new ways to create a show that can resonate with the audience. We are not only a dance program but a dance company that is committed to creating high-quality shows; Shows that will Evoque all the senses taking the audiences on an unforgettable Journey. Premiere at BlueShore Financial Centre for the Performing Arts at Capilano University - North Vancouver on June 1st and 2nd, 2018. Marbled - The great solution to all human problems is individual inner transformation. Marbled is Lamondance's 9th show, a mix collaboration of artists from Vancouver's arts community presenting dancers from 3 different nationalities, a collaboration from Multiple voices in a show that will Evoque all the senses taking the audiences on an unforgettable Journey. We can't wait to share more information with you about the show. Check out the incredible team of creators behind Marble. DanceHouse, in partnership with Lamondance Training and Performing Company, is happy to offer a unique masterclass opportunity with Toronto Dance Theatre.Toronto Dance Theatre Masterclass with Nicole Rose and Roberto Soria. Toronto Dance Theatre is one of Canada’s leading dance companies, recognized for the intelligent vision of its choreography, the beauty of its productions and the exceptional artistry of its dancers. Founded in 1968 by Peter Randazzo, Patricia Beatty and David Earle, and under the artistic direction of Christopher House since 1994, TDT has produced a remarkable body of original Canadian choreography. Christopher House is one of Canada’s “most enduringly inventive choreographers” (National Post). His works are acclaimed for their movement invention, musicality and deft handling of multiple layers of meaning. TDT’s dancers are passionate artists who play an essential role in the creative process, celebrated for their physicality, imaginative daring, and sensitive, playful ensemble work. This year is TDT 50th Anniversary season. special #workshop today at @lamondance with Cindy Salgado from Kidd Pivot. A fantastic opportunity provided by DanceHouse, in partnership with Lamondance Training and Performing Company. Thank you to all the dancers that attended the workshop. Sign up with your email address to receive news and updates To learn more about our performances and events.